Me and Robert often watch Kuchnia.tv, a cooking channel, and one of the programs is sponsored by the new Samsung oven that has two separate chambers for two different meals baked or grilled at the same time in different temperatures and cooking times. Very high-tech, so we, having in mind next year's planned redecoration of our kitchen, immediately got excited, thought of buying this oven and started looking for its price. And then it struck us... how often do we really need to bake two completely different meals AT THE SAME TIME? Well, never, to be exact. I often bake or grill meat with vegetables, but that's it, it's one dish. When I bake a cake I always do it way before the dinner, not while making dinner. I'd rather buy a bigger oven with some handy interior like easy-to-access sliding racks, ect. 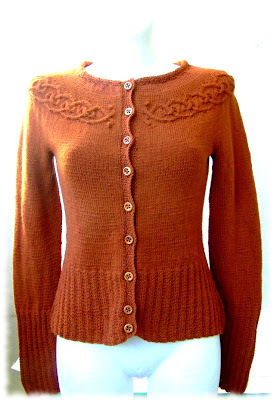 Here is the finished Tangled Yoke Cardigan. 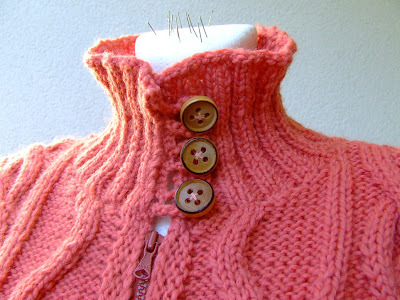 I finished it on Sunday and added the buttons on Monday. I love everything about it - the colour, the shape, the size (I'm glad I knitted the sleeves longer, they fit perfectly). The only thing that is a bit odd is the top part (I'm not sure if it's visible in this picture) - I bought this yarn some time ago on on-line auction from somebody who had a stash of old yarn, and it turned out that one of the four skeins of wool had a slightly different shade of brown... That is why the very top of my cardigan and the button bands look different. Wow, how pretty it is! you're a great knitter, maybe the next one will be one of the knitty patterns? Tangled Yoke looks just smashing. How about a modelled shot?? Your TYC looks awesome!! it really is a wonderful color. I bet you look great in it. I love what you did with the collar on Lucinda! great way to keep your neck cozy! Isn't it amazing how easy it is to be sucked in by commercials? It's definitely important to take a step back and think about these things before buying! Your tangled yoke is beautiful! !